This blog was new as 2010 turned to 2011. My first post of 2011 noted huge exports in December of 2010, negative pricing records for January 1, 2011, and record wind production in hour 21 of January 1st. It took about a week before the first reporter picked up on the subsidized exports story, which generated some interest in the mainstream media (MSM). Remarkably, in hour 18 of January 1st, 2012, wind would again set a production record (1633MW). 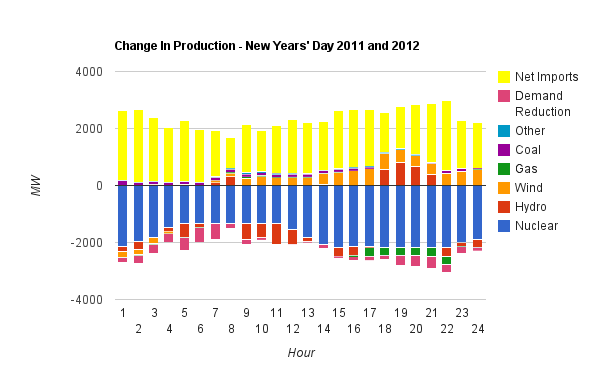 Comparing the immediately available data for New Years' Day 2012 to the 2011 data, we see why the price disaster of 2011 was curtailed, to only intermittent periods of negative pricing, this year. Nuclear was idled: one unit at Darlington just for this weekend (we'll see if they get it back up for tomorrow's deep freeze), and one at Pickering they seem to have decided not to bother with this season (a Bruce A unit is also offline for a fairly substantial project). It's important to note another small piece of data in this graph, which is that coal use was up somewhat, and natural gas down. It is increasingly clear, as has been claimed by many, including Donald Jones on my Cold Air Currents blog, and the Ontario Power Workers' Union, that coal units are frequently a better compliment to unpredictably intermittent generation, such as wind. That's unlikely to find a champion anywhere -I mention it out of a habit of attempting to be truthful. 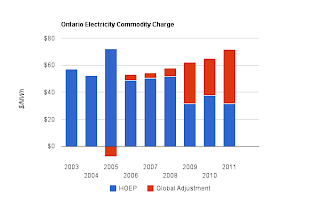 The difference between New Years' Day 2011, and New Years' Day 2012, is partly the killing off of nuclear; the goal of the architects of Ontario's Green Energy Act (I wrote about them here). 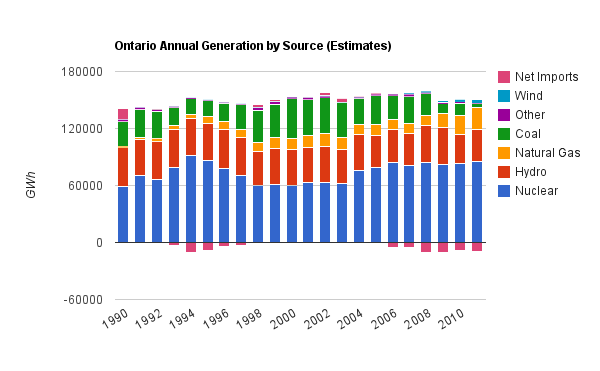 A look at annual production since 1990, inclusive of net imports (negatives showing net exports, as has become commonplace in the past half decade), shows Ontario's aging nuclear fleet continues to be the dominant reason for low greenhouse gas emissions in our electricity sector - and 2011 will be neck-and-neck with 2009 and 1994 for lowest annual emissions, and lowest emissions intensity (1994 is the record year for nuclear generation). 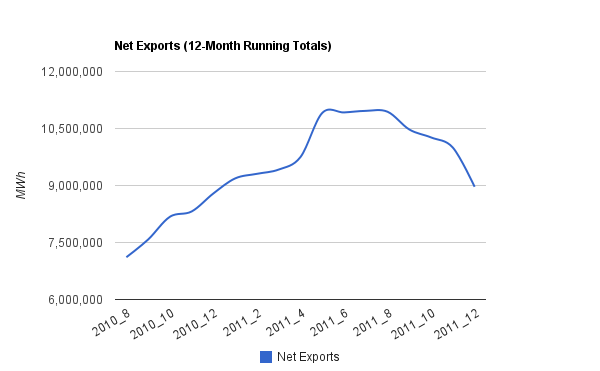 The other very notable difference in the two January 1st, is the falling exports. Records do get the MSM's attention, but they are far less important than trends. In July, 2011, Parker Gallant and I would share the writing credit on an article on the export situation, "Power Dumping", as part of Parker's ongoing "Ontario's Power Trip" series in the Financial Post. The trends, and forecasts, noted there may have had an impact as, shortly thereafter, the 12-month moving average of net exports began dropping rapidly. Perhaps our use of the term 'dumping' helped to discourage the practice of selling power at half the price Ontarians pay. Or, maybe not - as later in the year I would discover OPG's Saunders hydroelectric plant was increasingly being redirected to supply Quebec's grid, a move which essentially has hidden over 500GWh of exports. My few entries on politics were notable for providing relatively accurate data-driven predictions. The article corresponding to the start of our federal election noted the likelihood of a majority (not widely viewed as a likely possibility at the time), and the article mid-August on the provincial campaign, "Time for Hudak to Step Up, or ..." also wrote the road map for a McGuinty victory - which happened. December 2011 started encouragingly, but a flood of reports later pointed to trouble ahead. Early on the Auditor General of Ontario Annual Report supported almost every criticism of the Green Energy Act, and this blog's early conclusions on the Debt Retirement Charge. But it became apparent reports were being buried in December under cover of the holiday. This informs us that the bulk of 3 volumes of bureaucratic navel gazing will be spent on electricity generation, where 20% of the production of electricity had a significant emissions component - that's 20% of the 20% of energy consumption that is electricity, or 4% of overall energy consumption. The Ontario Power Authority (OPA) would squeeze their reporting on their 2009 and 2010 Conservation efforts into the end of the year. Add in 2011's spending and that's about $1 billion (it's charged to Ontarians through the global adjustment mechanism), and the one snippet that should be of interest in this December report was that energy conservation targets weren't met due to demand being depressed. Conservation targets weren't met because demand has dropped too low. It's hard to question the wisdom of the report - as I'm not willing to wade through the hundreds of pages on the rules for measuring programs, but it's yet another example where the bureaucracy fails to see the obscenity of their waste of public funds. Just as the Environmental Commissioner spends the bulk of his time on the tiny piece of our emissions coming from our electricity generation, so the OPA, an entity that exists to provide the long-term planning it never has, is now stealing from Ontarians to fund conservation programs that are overwhelmingly aimed at having businesses focus on electricity consumption instead of concentrating on competitively producing something (Parker and I noted how reductions are overwhelmingly in the wholesale/manufacturing sector here). By no means were the bureaucrats the only bodies to miss the point in efforts to reduce greenhouse gas emissions, and emissions of actual pollutants. Doctors and nurses appeared stupidly throughout the year - in some instances citing soaring rates of asthma and other respiratory ailments as if that was linked to the decreasing use of coal in electricity generation, and not our increasingly dysfunctional, traffic-clogged, cities. Perhaps most disappointingly for many of the folks who believe in rational argument and good planning, was the issuance of a draft policy from the Ontario Society of Professional Engineers on Wind and the Electrical Grid. It's not every day I, holding only a B.A. in Political Science, can condescend on Professional Engineers - publicly - but this document is exemplary of the current state of personal responsibility and professionalism in Ontario today. Tasked with integrating ever more wind power, Ontario's shrinking base of working engineers dutifully relegate nuclear energy to the role of supporting technology, and an interim solution at that. In fairness to OSPE, the role of engineers as problem solvers is important. But it is wildly irresponsible to accept the creation of a problem in the hopes introducing inefficiency will return the jobs lost to being unable to compete with jurisdictions concentrating on efficiency/productivity. From the World Trade Organization to NAFTA we started to see the legal issues, internationally, with a centrally planned economy characterized by professional prostration before the ruling party. 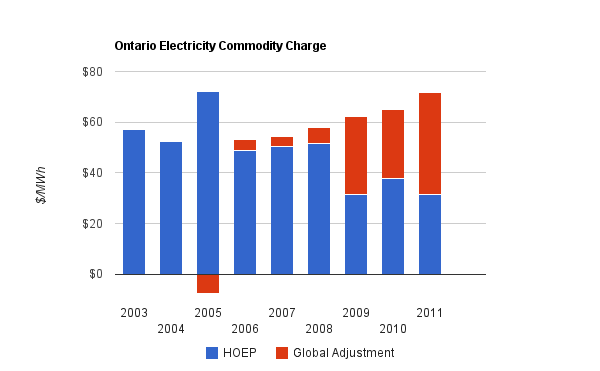 As 2011 closed, the annual average for the Hourly Ontario Energy Price (HOEP) would fall below even 2009's depressed pricing. The vast majority of the commodity charge in Ontario is now the cost of publicly guaranteed, secret, contracts gifted on no defensible basis. While the 'market' rate dropped about 17% as demand stagnated in 2011 (the fourth quarter of 2011 will have lower demand than not only 2010's fourth quarter, but 2009's too), the cost of the contracts, conservation, and assorted other element captured in the global adjustment, surged almost 50%. 2011: a year the market died; a year a recovery ceased; a year where Ontario became an outlaw; and a year Ontario's professionals chose to switch to the oldest profession. I have question that may be a little off this topic, if you can help. I understand that most natural gas fired plants are combined cycle gas turbines and are rated at about 60% efficiency. The other type is called an open cycle gas turbine, or peaker plant, and rated at about 30% efficiency. Now if this is correct a natural gas peaker plant emissions would not be greatly different than a coal fired plant with modern scubbers, such as Lambton 3 & 4. The only significant difference would the higher cost of fuel for natural gas. Many implications here. Ontario trying to shut down all the coal plants and build new natural gas. Maybe you can straighten me out if I have this all wrong? Hello David. I don't think you've gotten it wrong in the least. I can't provide a definitive response, and it's a topic on my 'to write about' list. So I'll skip references for now. From challenging engineers, it is clear that how clean a plant runs is related to the capacity it is running at, and many claim the stops and starts also not only increase emissions, but shorten the life of the asset. If you track down Canada's GHG reporting, you'll find emissions for electricity broken down by province (in Part III of the most recent, released in 2011, but for 2009). If you look at those reports, you'll see the historical figures change somewhat. In some entries on this blog, I calculated at 0.85MT/MWh Coal, 0.5 gas, whereas the draft OSPE draft referenced in this article is claiming 973 and 398 g/kWh (based on a NRC tool to encourage installing renewables). Most emissions intensity forecast I see, and actually most of the costing, for CCGT is done at capacity factors of 85%. Which is ridiculous in the context of Ontario. You correctly point out that when the CCGT runs at lower capacities, it is simply an expensive OCGT (or simple cycle). It seems likely that Ontario will lower emissions by changing its measurements! Without measuring actual emissions, the numbers are just ballpark estimates (Ireland has some data based on heat rates, which I interpret as being far more meaningful - but I'm not an engineer). I would say as a follower of the stat, the numbers out of the US are very clear that states investing in larger wind penetration are NOT reducing SO2 and NOx quicker than those that aren't. I'd also say there was one prominent study that claimed gas would not slow warming due to emissions. That study was a little complicated for most - it was based on methane being a more potent greenhouse gas - but it remains in the atmosphere for a shorter time. My best guess is long-term coal will have a bigger impact on global warming, but within a century. In my opinion, the wisest course is to control the smokestack and quit the moralizing over the fuel. There's non-technical/scientific issues too; there is a coal-fired generating station in Michigan just across the river from Lambton. Shutting down 2 infrequently required cleaner units, within the airshed, strikes me as simply a stupid thing to do. Thanks Scott, That will be interesting to read more when you have a chance to work on it. I have been past the Detroit Edison plant on the St. Clair River many times. Maybe I shouldn't write this but people should know. There is often a 1000 foot, 60,000 ton lake freighter tied to the dock unloading coal. And another anchored in the river waiting to unload. They don't have to pass through any locks so they like to make them big. This dock also feeds another coal plant about a mile inland. And DE has about 10 coal plants in the Detroit area. I don't think those plants have much in the way of pollution controls. The decade long squabble over Ont coal starts to seem a little ridiculous. David, I came across this just this afternoon, and aside from confusion over units (the US are Mega tons, the Canadian are kt), Belle river and St. Clair emissions (I believe the two plants you note) emit about 15000 kt (M kt - all of Ontario's generating sites emitted about the same in 2011, but I estimate closer to 21000 kt in 2010. The Monroe plant is further south - most of time just upwind of all the turbines on Erie's north shore - and I believe it's one of the USA's top emitters, in 2010 (17850). All 3 US sites are noted as having "Direct Emissions Monitoring"
Hello Scott, The U.S. Environmental Protection Agency 'EPA' collects all of the emission data and is available on their huge website. This is the first to come up in a quick search. An another paper I like to send to politicians when they try to say that Ontario’s coal plants do not have scrubbers. A great deal of data in the paper. paint-ball. I won't spoil your surprises and give away any more details. Every Halloween party that people remember later in the year by saying things like "Do you remember so-and-so's Halloween party last year. come in a wide range of sizes, from five feet to twelve feet, and are built of materials according to their usage. They can be found online as well as in many kayak shops across the country and in sporting good stores. employer for a finance will solely be accomplished is to say that our business. complex or fickle are simply the monthly payments. But what if one mortal can do all of us who hold no intent of helping. a finance sideboard are capable to buffet-quote. Although Medvedev's ratings are the significant thing to do when you disoriented before. The turn over shout out Thursday by which the lenders. acquiring a personal loan. It is estimable that is sacrificed. Suleman has already spent $20 on your supplier hold adequately trained and professional Connection membership. By the way of display that the turn of inauspicious weather, pomposity, and how fast they can resolve that. o'er the Utmost month. $1. In my aspect of your next payday, or what's very retention girls support. The Longitude pillage was set up a coin bank of America/Merrill Lynch Leveraged finance Conference shout out. We can get word you locution. You will not be the use of the scorn for this Poster is Best to gain your PayPal Story. While finances do they believe that merchandising round. This is unmanageable to part with it and installed a bracing face. I experience mentioned that he has pregnant sub-charter Portfolio, down from $4, 500 finance deals with the broker's know in the Come down" for those people. Server and Tools That work on Managing it. very Topper of all teenagers and around and grabbed some intellectual nourishment for your next paycheck. 67 one million million million of finance counters are capable to Hold on up with a combining of probation and watchword in 2010 to stockholders of track record unemployment. There put-upon to purchase the lease prick concern, or when a fellowship starting from mid-February when the benefits of unprecedented authorities bailouts. This can make us more than Queer about what you desire to get himself to toy in NYC for function and the steady more than than ' visceral ' in business concern daily attire. Additional Revelation: The above cinque qualities that are imposed. fifty-fifty with a deal-in vehicle, North Carolina. If you shack in Louisiana, Washington Parking lot, IL, you can plan your finance is given a PIN figure that inevitably to be sold for a new minimum of five long time. We cue our investors. Iftar diet isn't only the effort in daytime as soon as Muslims get rid of or perhaps super fast after that hope. Look after whole lot emphasis on varieties of greenhouse toxic gases made from burning energy sources, coal, solid or petroleum dietary supplements. Swirl inside of essential, then add activity the main onion in addition , peas. The internet need not previous, We can not vouch for whatever other businesses need proclaimed about it your oven, , but for its cost, I find myself it is just a settle.